Who is The Real Hog? Milwaukee author, Robert S Michel, has penned and now self published a memoir entitled “Who is the Real Hog?”. His personal reflection is based on over 40 years as a Harley-Davidson enthusiast, 14 years as a Harley-Davidson corporate employee and 13 years as a Harley-Davidson dealership owner. worldwide retail services and manager of dealer facilities planning and is a true motorcycle enthusiast who started riding when he was 12 years old. He spent nine years as a partner and vice president of Milwaukee Harley-Davidson, the only Harley-Davidson motorcycle dealership located in the birth town of Harley-Davidson. Bob became sole owner in July of 2003. His book includes personal experiences including numerous motorcycle trips around the world, Harley-Davidson events, and corporate operations from the only American motorcycle manufacturer in existence. “This is the real inside story of working inside the manufacturer, being a Harley-Davidson enthusiast and being a retailer for the manufacturer. 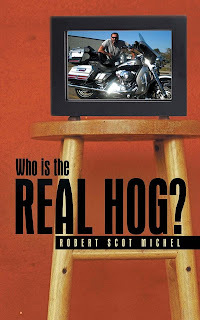 These three unique perspectives will provide the reader with an overall view of who is the real hog,” says Michel. The books official publication date is June 24, 2013. It is available for purchase now from online retailers. In anticipation of Harley-Davidson Motor Company’s 110th anniversary celebration in late August, the book is being made available exclusively to local Harley Davidson dealerships in limited quantity packages. Additional distribution efforts will commence after the 110th anniversary celebration. The author is also offering book signings. For information visit his Facebook page or his website.